Five universities nominated their best students for the trip, among them are participants and winners of IT Eureka contest. The journey started on November 2nd. The students spent two weeks in Sweden, learning from professors of Linnaeus University and other European higher educational establishments and meeting successful entrepreneurs. After this trip, the young specialists will be welcomed to Portugal. 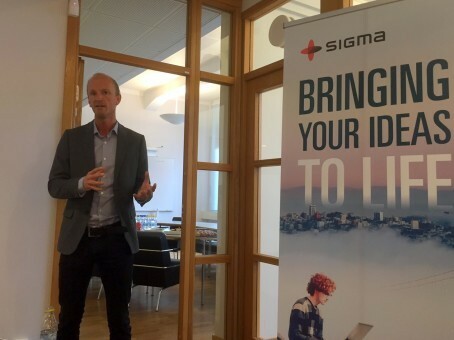 On November 6th, the students visited the Sigma office in Växjö for a series of lectures and speeches from the company`s representatives and Sigma Clients about innovation and the way to apply it to work. The day ended up with a networking party. Konstantin Timofeev, Project Manager at Sigma Software, has also spoken at the Sigma Day and shared how innovative thinking and courage to try new approaches helped our team to develop an idea into a successsful product. Smålandsposten has also attended event and prepared an article about the Tempus program (the article is available to Smålandsposten subscribers).